The Lovin' Spoonful are an American rock band originally active in the 1960s. 1965 and 1966 had been very successful years for The Lovin' Spoonful - with four hit singles and two albums released, they also got the chance to record the soundtrack for a Woody Allen film (What's Up, Tiger Lily?). Before the year was out they would have three more hits. The first of these proved to be their biggest, as the hard-driving "Summer In The City" became their first #1 pop hit. It also charted at #8 in the UK. The follow-up singles "Rain On The Roof" and "Nashville Cats" got to #10 and #8 respectively. 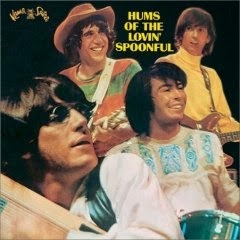 All three singles were featured on their third album, Hums Of The Lovin' Spoonful, released late in 1966. It proved to be a much more diverse record than their first two, mixing various strains of folk, blues, country and jug-band music into a collection of upbeat good-time music. For the first time, all the songs were written (or at least co-written) by frontman John Sebastian. The album itself charted at #14.